Shanghai Ding House of Dumplings (上海鼎) has been in Penang coming to a decade now with another branch in Pulau Tikus barely 3 months’ old. The restaurant served some delicate dim sum from steamed, deep fried, fried, pan fried, baked, desserts to starch items such as rice, porridge and ramen. Thus, this restaurant has been a frequent dining place for those who wished to have something light and out of the norm. 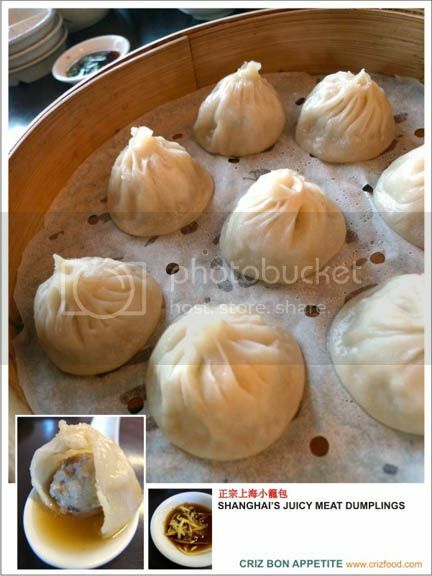 Their Xiao Long Bao aka Mini Meat Dumplings have been one of the hot selling items since day one. You would have a choice for 4 types, namely original, crabmeat, scallop or superior. We opted for the original Shanghai Juicy Meat Dumpling (上海小籠包 – RM6.80+ for 4pcs or RM12.80+ for 8pcs) just to try out the authentic taste. Although the price was relatively cheap compared to other establishments, somehow the broth within was not as flavorful as those I have tasted. Moreover, the meat was rather mushy to my liking. A little bit of sesame oil and rock sugar in the broth plus a bit more of rice wine and corn flour added to the minced meat for a firmer texture would have done more justice to this delicacy. 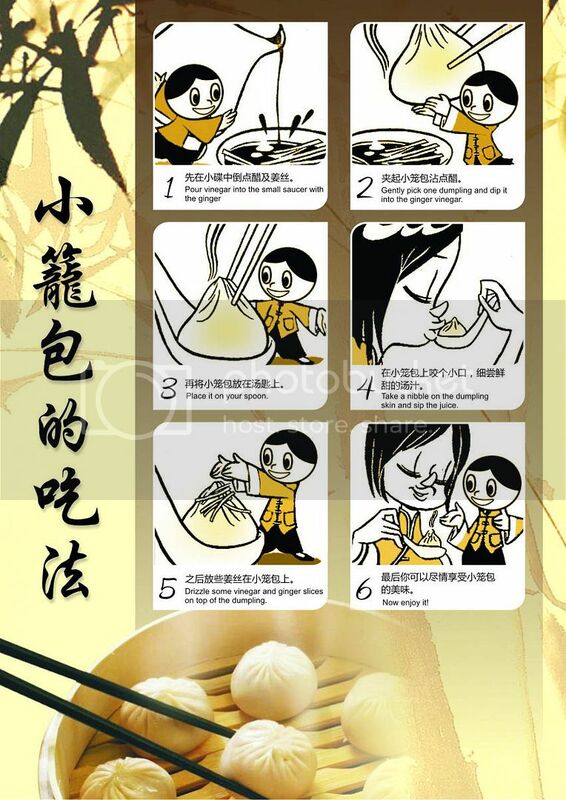 By the way, most people are not aware of the right way of having a Xiao Long Bao and got splattered with juice. The right way (view here) would be to gently pick up the dumpling and place onto a spoon. Nibble a small corner and sip up the soup. Apply some sliced ginger in black vinegar on it and enjoy the dumpling. There were also two types of prawn dumplings. 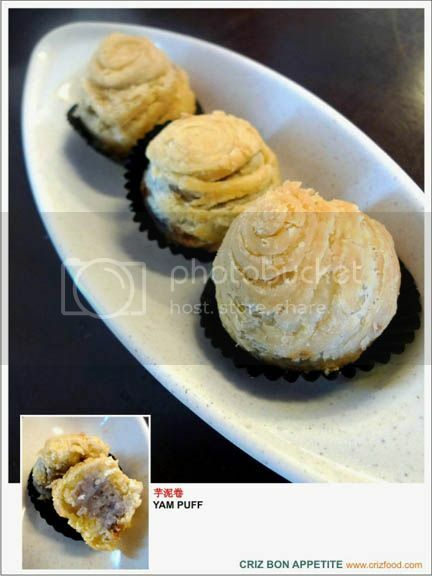 I chose the Scallop and Prawn Dumpling (帶子餃 – RM5.00+). The combination was just right – simple and fresh. It went well with the easily available homemade chili sauce and sweet potato sauce (甜醬). One of the steamed buns caught my attention. It was the Pockey Mouse (奶皇刺猬包 – RM4.80+). They were cute looking and looked just like the Porcupine Pokemon~ LOL! The filling was different compared to another available steamed bun called the Creamy Salted Bun with oozing salted custard. This one had that more sandy texture and milky taste with the color coming from a very orange egg yolk. The buns tasted great but it would be nicer if some finely chopped salted eggs were added in. 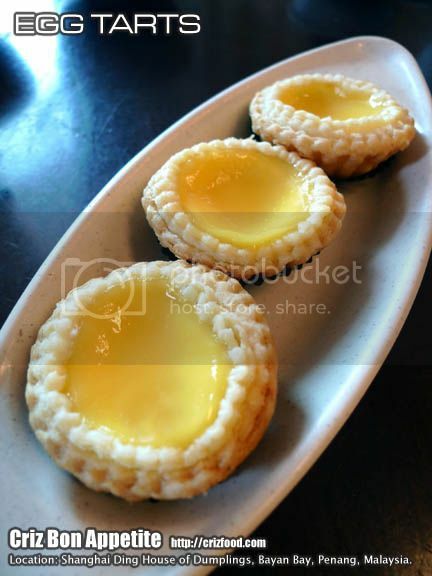 Mini Egg Tarts (酥皮小蛋撻 – RM3.80+ for 3pcs) were also available during weekends. The overall taste was fine without overpowering sweetness but the crust was not as flaky as I expected. I simply love those which came out straight from the oven. On the other hand, the newly introduced Yam Puff (芋泥卷 – RM4.80+ for 3pcs) was amazingly appetizing. Not only were the puffs flaky, they were mildly sweetened to my liking. The chef was also good in his skills and creativity. Next on the list were some Fatty Birds (小神雕 – RM3.80+ for 3pcs). 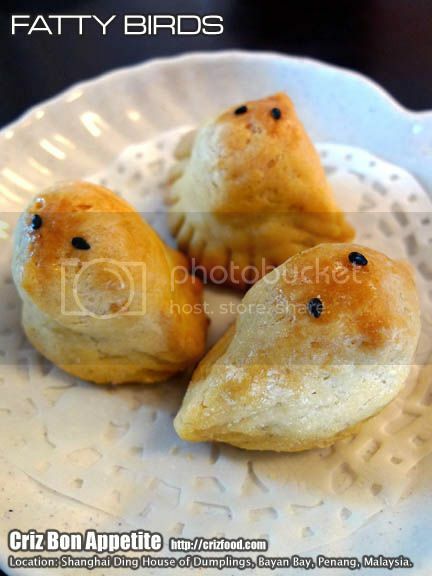 Those were some sweetened red bean paste filled pastry in the shape of mini birds. Roasted Pork Bun or so called Bo Lo Bao aka Pineapple Bun (菠蘿叉燒包 – RM3.00+ for 2pcs) has a combination of sweet and savory pastry. These buns are famous especially in Hong Kong. The bun actually does not contain any pineapple as named but has a sugar cookie like crusting on top depicting the texture of a pineapple. The baked bun here did not have that design but was great to consume as the sweet crusty topping complemented well with the moist honey roasted pork (char siew) within the bun. 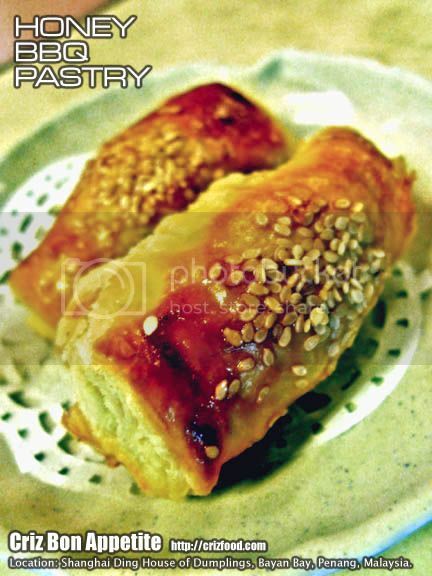 You can also get Honey BBQ Pastry (叉燒酥 – RM3.00+ for 2pcs) during weekends. Each roll had moist honey roasted pork wrapped with flaky pastry. 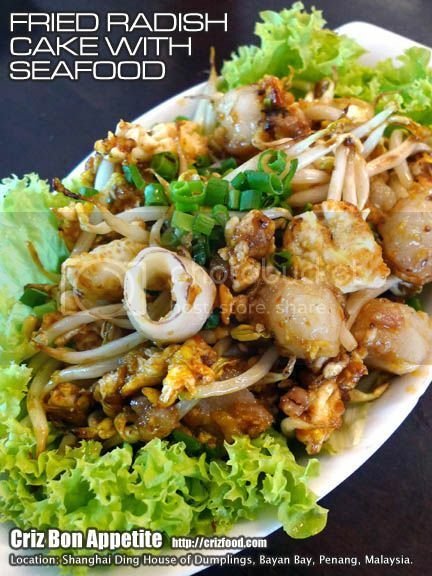 One of the most ordered items here is the Fried Radish Cake with Seafood (海鮮炒蘿卜糕 – RM7.80+). The radish cake which has been steamed with flavors coming from the finely chopped dried shrimps and Chinese sausage were cut in cubes and stir fried with prawns, squids, salted turnip (菜脯), dried chili paste, egg and lots of bean sprouts. It had that wok hei (high heat cooking) that I liked but the texture of the radish cake was a bit too soft to my liking. Moreover, it was a bit overpriced with barely a few cubes of radish cake present but with loads of bean sprouts. 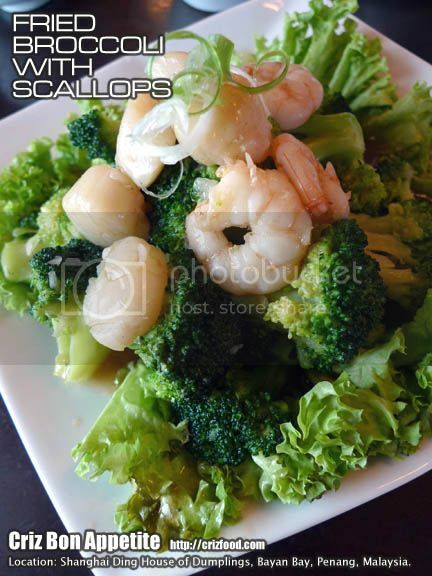 You can also order some side dishes to go with your meal such as the Stir Fry Broccoli with Scallops (西蘭花炒帶子 – RM15.80+). This was just a normal household dish with blanched broccoli topped with stir fried scallops and prawns in oyster sauce. There were also a few types of dry and soup ramen from as low as RM4.80+ available here. One of the restaurant recommended ones was the Shanghai Pork Ribs Ramen (上海排骨拉麵 – RM7.80+). The dish hand smooth and silky ramen with the right al dente, served with clear pork stock with some Chinese cabbage aka baby bok choy (小白菜) and steamed pork ribs. This dish was marked as spicy but it was really mild. The only mild spiciness was from the tender steamed pork ribs which had been marinated with some chopped garlic, chili paddy, soy sauce and rice wine. Overall, it was still a nice bowl of ramen except that the kitchen should have taken note on the choice of pork ribs. My serving had too much of bone splinters from the pork ribs. The next dish was amazingly rich in natural sweetness from the 7-8 hours fish bones simmered stock. 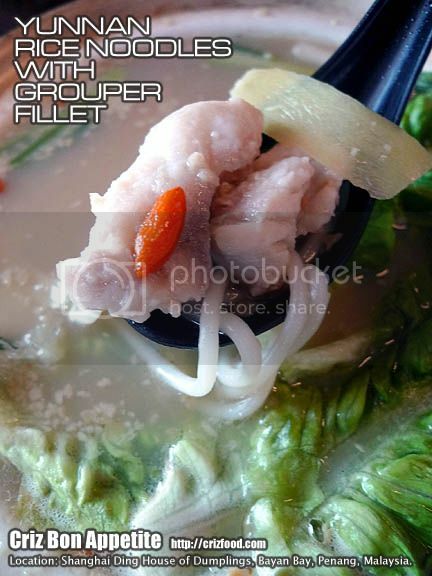 For those fish lovers, you would love this Yunnan Rice Noodles with Grouper Fillet (雲南石斑魚米綫 – RM19.80+ for 2 pax). I loved everything in this dish from the texture of the imported rice noodles, the freshness of the grouper fish fillet, the baby romaine lettuce (yaw mak/油麥菜) and rich in flavors fish soup. The added Chinese wolfberries sure boosted up the soup with extra sweetness and the gingery flavor from the quality ginger used pepped it up further. The rice noodles looked almost like the traditional laksa rice noodles but had a firmer al dente bite. This was one awesome dish! 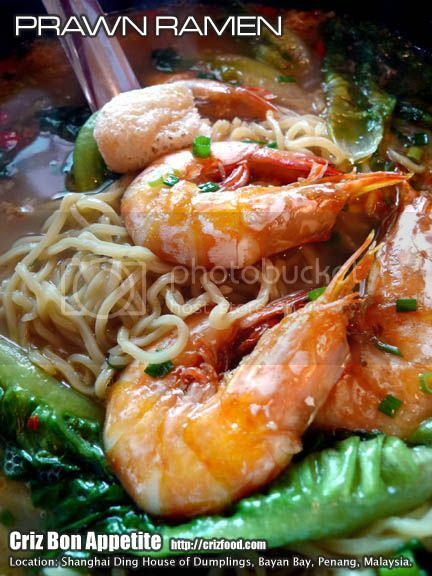 Another of the new ramen dish introduced was the Prawn Ramen (老火上湯鮮蝦拉麵 – RM28.00+ for 2-3pax). 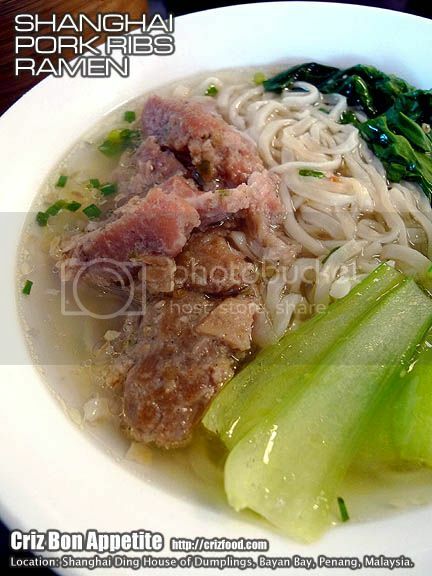 This was another great noodle dish by the restaurant. The stock had the flavors from loads of bones and prawn shells which I believed had been sautéed to extract the creamy sweetness. There were hints of some secret ingredients being used such as licorice, a light touch of rock sugar and more. The ramen had all the flavors soaked in and was my perfect bowl of noodles. The dish came with 4 big fried prawns, bamboo pit, some baby romaine lettuce plus some sprinkles of wolfberries and chopped spring onions. Most recommended! As for dessert, we had the Ginger Tea with Black Sesame Filled Glutinous Rice Ball (姜茶黑芝麻湯圓 – RM3.80+). I loved the strong gingery taste from the soup, obviously extracted from the reputable old ginger from Air Itam. 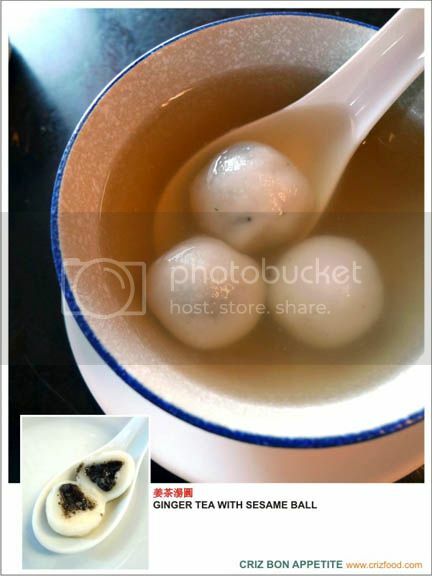 The tang yuan (glutinous rice ball) was nice and soft with fragrant flavor from the filled black sesame seeds. It would be great if some coarsely crushed toasted peanuts (just like the traditional tang yuan I had in town) were added in for that extra crunch. This dessert would be ideal for those with regular “stomach wind”. 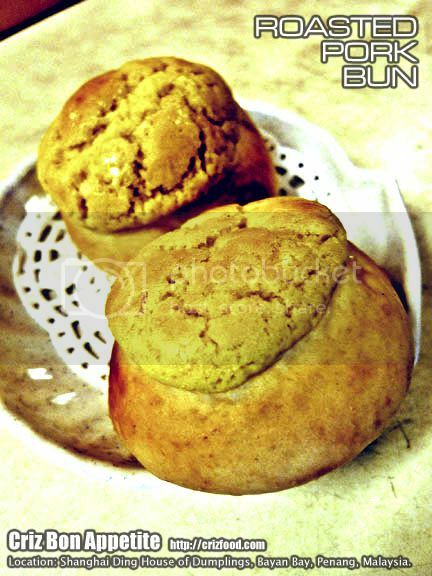 You can also have Durian Pancake (榴蓮煎糕 – RM7.80+ for 2 pcs) regardless of the season served here. 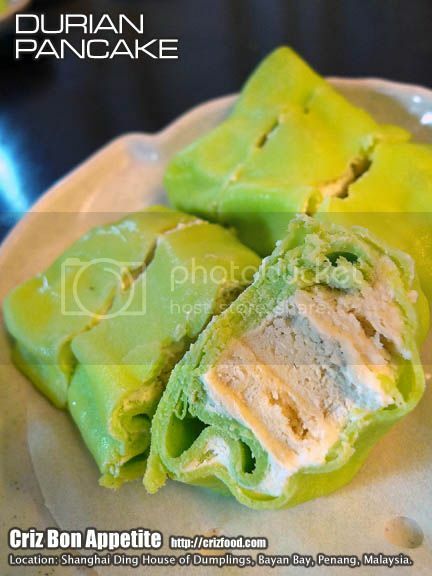 The screwpine (pandan) flavored crepe-like pancake had some durian meat and cream all wrapped up within. Taste wise, it was acceptable but it lacked the strong local branded durian taste as the ones I had at Lucky Dessert (發記甜品) kiosks at Queensbay Mall and Gurney Plaza. All items will have a 5% service tax for both branches. 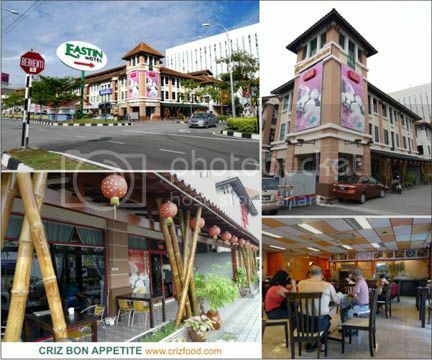 Overall, the restaurant would be an ideal place for those who prefer to dine in air-conditioned restaurants. As for taste and price, dishes served here are still within the acceptable level but the pricing can be a bit high for some of the items. As for food choices, there are still rooms for improvement. I do hope that they would have more options for their dim sum such as my regular dim sum shop in town. The Shanghai Ding House of Dumplings is located just at the entrance leading to Eastin Hotel, Penang (next to Queensbay Mall). If you are coming from Georgetown towards Bayan Lepas Free Trade Zone via Bayan Lepas Expressway, do watch out for the Pulau Jerejak signboard (leading to Pulau Jerejak jetty) on your left. Ignore the turning and drive on to the next left junction with the Eastin Hotel sign. Turn left into Jalan Aziz Ibrahim and drive on until you a roundabout. Turn 3 o’ clock and drive on until you see a big Eastin Hotel signboard at the first right junction. Turn right and you will see the restaurant at the corner lot. There are limited car park spaces in front of the restaurant. If you can’t find a parking space, there are many car parks surrounding that area. 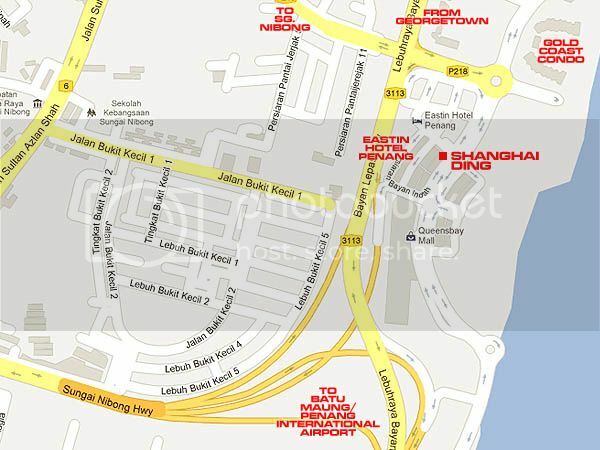 Address: Block H, 4/G, Persiaran Bayan Indah, Bayan Bay, 11900 Bayan Lepas, Penang, Malaysia. Address: 417 Jalan Burma, Pulau Tikus, 10350 Penang, Malaysia. 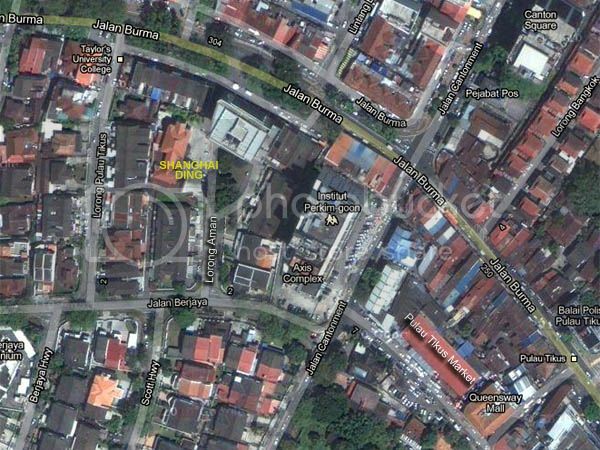 Note: The PT branch is hidden from the main road of Jalan Burma. The best way to reach this branch would be through Jalan Cantonment into Jalan Berjaya then turn right into Lorong Aman. The branch would be right at the end of the lane on your left. This building formerly housed the Old Xaverian Association. THE CHEAPEST DIM SUM IN PENANG? 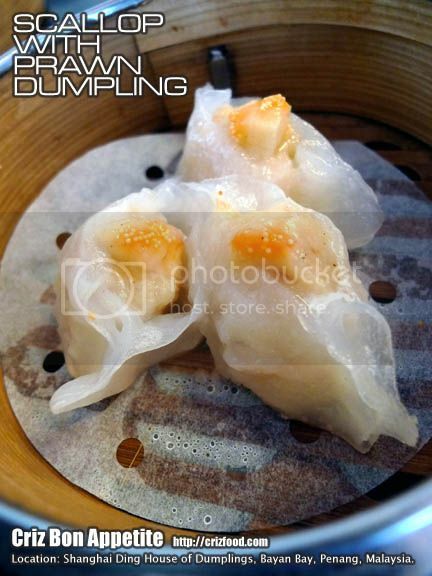 I would try this when I go back to Penang… the Shanghai dumpling and dim sum looks good! 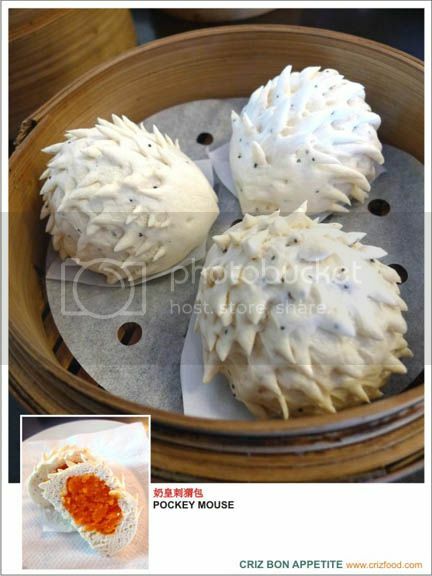 the porcupine-looking dim sum is filled with custard? 🙂 that’s a creative presentation!